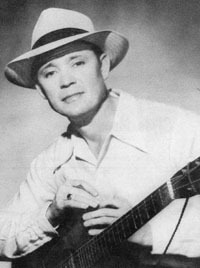 Songwriter, singer Jimmie Skinner was born on a farm near Berea, Kentucky. His early influence in hillbilly music like many folks then was Jimmie Rodgers. Later on, Jimmie's family moved to Hamilton, Ohio where as recently as the mid-1950s, he still made his home. Jimmie recorded on several labels. His first recordings appeared on the Radio Artist label. From there, he moved to Capitol records for a couple of years. Later, he moved to the Decca label. Jimmie was also a bit of a business person. When he was in Ohio, he started up a large record store with his manager, Lou Epstein called "Jimmie Skinner Music Center" that was located at 222 East 5th Street in Cincinnati, Ohio. Jimmie's store specialized in country and gospel recordings and was reported to have one of the largest selections to be found. They said their customers came from servicemen overseas and other regular buyers from remote places such as Hollywood, Alaska, Japan, Canada and other countries. This shop was located just across the street from the Greyhound bus station and only a block from the WCKY studios, so you know visitors to Cincinnati found his store. From his store, Jimmie had a regular daily show from 9:00 to 10:00am, Monday through Friday and from 12:00 noon to 1:00pm every Saturday over radio station WNOP out of Newport, Kentucky. To give you an idea of how far a dollar went back then. Jimmie had a fan club at the time that was run by Mrs. Lillian Munz. The dues were all of $1.00. For that $1.00, you got three fan club journals, an autographed picture of Jimmie and a membership card. One of Jimmie's band members was a long time member and added a distinct sound that was heard on most of his recordings. That sound was an electric mandolin that was played by Ray Lunsford, who was from Broadhead, Kentucky. Country Song Roundup No. 32; June 1954; American Folk Publications, Inc.; Derby, CT.
1209 B Will You Be Satisfied That Way? 70894 A Will You Be Satisfied That Way? 71192 A I Found My Girl In The U.S.A.